A 40-year-old woman came with the complaints of abdominal distension and chronic pelvic pain for 6 months. Ultrasonography showed a large cystic mass in the left adnexa. Total hysterectomy with bilateral salpingo-oophorectomy was performed. On gross examination of the surgical specimen, it was found that the endometrium, myometrium, cervix, and right adnexa were unremarkable. The left adnexa showed two ovaries and a fallopian tube as seen in [Figure 1]. A large, serous fluid-filled cyst measuring 12 cm × 9 cm was noted in the left eutopic ovary. On microscopic examination, the endometrium, myometrium, cervix, and right adnexa showed normal histomorphology. Sections studied from accessory ovary showed normal histomorphological features. The cyst in the left eutopic ovary was diagnosed as serous cystadenoma on microscopy. Further inspection and ultrasonography revealed no other genitourinary or pelvic anomaly. Ectopic ovaries including accessory ovaries and supernumerary ovaries are very rare gynecological conditions. The distinction between accessory ovaries and supernumerary ovaries was defined for the first time by Wharton. Wharton's criteria for supernumerary ovary are; the third ovary must contain ovarian follicle tissue, it must be entirely separated from normally located ovary, and it must arise from a separate primordium. Accessory ovary can be distinguished from supernumerary ovary by its relationship with normal ovary, as it is situated near or connected to normal ovary. It can also be found attached to the fallopian tube or one of the various ligamentous structures of the utero-ovarian complex. The present case can be categorized as accessory ovary according to Wharton's criteria, given its adnexal location and attachment to uterine ligament. Also, since there was no history of previous pelvic disease or surgery, we believe this case to be a true embryologically ectopic ovary with reference to Lachman's nomenclature. Accessory ovary is defined as a third ovary which has close proximity and some form of association with eutopic ovary and its blood supply. It was first described by Grohe in 1864. Its incidence was reported to be 1:93,000 by Wharton in 1959. There are two theories which explain the formation of accessory ovaries. According to the embryological theory, they are formed as a result of the abnormal separation of a small part of the developing and migrating ovarian primordium. The second theory by Lachman and Berman explains the formation of accessory ovaries in cases of acquired conditions such as inflammation and surgery. According to this theory, part of the ovarian tissue which is detached from the ovary could implant anywhere in the pelvic cavity and continue to function in vivo. As accessory ovaries develop from abnormal embryogenesis, congenital anomalies, or genetic defects are often associated with them. These malformations include accessory fallopian tube, bicornuate uterus, and renal agenesis. The accessory ovaries have both the functional and pathological potentials of normal ovaries. There are reports of tumors such as mature cystic teratoma, serous cystadenoma, mucinous cystadenoma, Brenner tumor, steroid cell tumor, sclerosing stromal tumor, and fibroma arising from accessory ovaries. Thus, any tumor arising in the normal ovarian tissue can develop in accessory ovary, although they are extremely rare in accessory ovary. Accessory ovaries are subcentimetric  and asymptomatic in most of the cases. Thus, their preoperative diagnosis is notoriously difficult, and they are usually an incidental finding. They are also one of the under-reported gynecological conditions. However, they are of great clinical significance as they have a very strong association with various congenital malformations and neoplasms. Suspecting an additional ovarian tissue also plays a decisive role in the management of certain conditions where the removal of all of the ovarian tissue is crucial, such as hormone-dependent neoplasia, preventive oophorectomy in high-risk women, and radical treatment of endometriosis. Thus, they should be taken into consideration in cases where a pelvic mass presents with normal eutopic ovaries and also vigilantly looked for in cases of laparotomies. Lim MC, Park SJ, Kim SW, Lee BY, Lim JW, Lee JH, et al. Two dermoid cysts developing in an accessory ovary and an eutopic ovary. J Korean Med Sci 2004;19:474-6. Sharatz SM, Treviño TA, Rodriguez L, West JH. 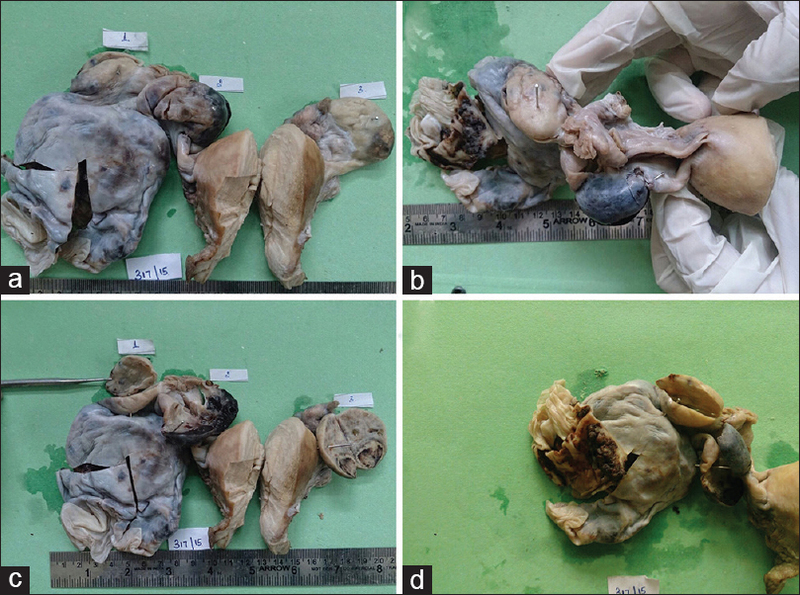 Giant serous cystadenoma arising from an accessory ovary in a morbidly obese 11-year-old girl: A case report. J Med Case Rep 2008;2:7. Kim AR, Sung WJ, Kim MJ. A fibroma with cystic change developing in an accessory ovary: A brief case report. Korean J Pathol 2011;45:319-21. Gabbay-Moore M, Ovadia Y, Neri A. Accessory ovaries with bilateral dermoid cysts. Eur J Obstet Gynecol Reprod Biol 1982;14:171-3.